We have uploaded some new content which may be of interest for route builders, these new assets are highly detailed, yet still efficient. Do the finer points of Trainz content creation sometimes seem elusive to you? 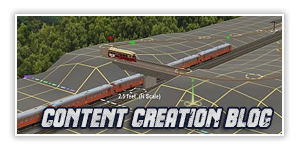 Well, my friend you need flail around no more because the Trainz Content Creation Blog is here to guide you.